A recent decision by the United States Supreme Court raises important issues for those whose homes are in foreclosure and are considering filing for federal bankruptcy protection. This case involved a borrower whose home was “underwater,” which means that the mortgage debt on the property (both a first and second mortgage) exceeded the current value of the home. In such cases, the bankruptcy counsel will often seek to have the second mortgage “stripped off,” that is, removed, so that it is no longer a lien on the property. The Supreme Court ruled that, in such situations, the second mortgage could not be removed simply because the house was worth less that the total mortgage debt. This ruling will prevent such homeowners from having second mortgage loans (which are often in the form of home equity loans) discharged by the Bankruptcy Court in a Chapter 7 liquidation proceeding. This ruling protects banks that make second mortgages from having these mortgages dismissed in bankruptcy proceedings where the home currently has a negative equity. 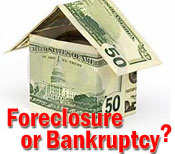 Our firm handles many cases in which we defend homeowners who are in foreclosure. We are often asked what the effect of a bankruptcy filing would be on such a proceeding. The first effect of a bankruptcy filing is to freeze all current litigation against the person filing for bankruptcy, as well as all collection efforts on any debts. Therefore, if an individual is delinquent in their mortgage payments, a bankruptcy filing would suspend all collection letters, phone calls, and, of course, litigation relating to all debts, including mortgage debts. Failure to comply with the automatic bankruptcy stay may subject the lending institution to Court sanctions, including fines. However, where there is collateral for a debt, such as a house or car loan, the lender has the option of petitioning the Court for a lift of the automatic stay as it applies to said collateral. Such a motion must be made in the appropriate bankruptcy court, and may take several months to be heard. If the motion is granted, the lender has the right to proceed with its claim against the collateral. What this means is that it may repossess a car where a car loan has not been paid, or may continue a foreclosure action against property. It may not proceed against the borrower to recover any monies due. In addition, there is a homestead exception in most states which protect a borrower’s home from foreclosure when bankruptcy is filed. In some states, the borrower’s primary residence is totally exempt and cannot be taken from the borrower. Other states, such as New York, exempt a certain dollar amount of the value of the property when bankruptcy is filed. The amount can also differ depending on the county in which the property is located. In such cases, where there is equity in the property, the amount of equity up to the maximum homestead exemption amount would be awarded to the borrower. Where there is no equity in the property, the lender may be permitted to foreclose and remove the homeowner after foreclosure, subject to the applicable statues and legal restrictions. We encourage all homeowners who may be subject to foreclosure to consult our firm so that all possible defenses, including filing bankruptcy, may be considered.